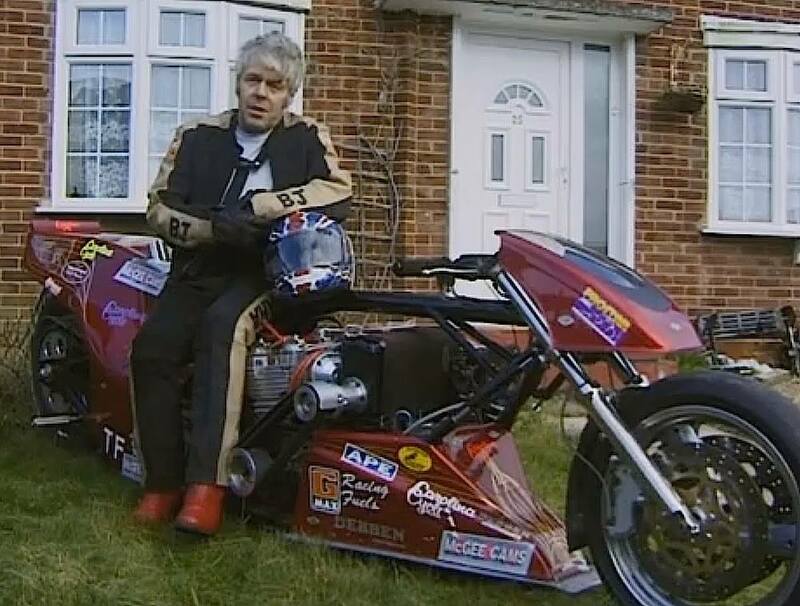 It was with a large measure of sadness that on April 13th, 2015 I read of the passing of British Top Fuel motorcycle drag racing legend Brian Johnson, via social media. I had to read and re-read the posting to let it sink in that Brian was somehow – no longer with us. At age 67, this great man, a true legend of European motorcycle drag racing, has been called home by God. Some say only the good die young. Let the record reflect that at Brian’s young age, we’ve lost a good one. APE Jay and Joe Sway present Brian Johnson with well-deserved awards. 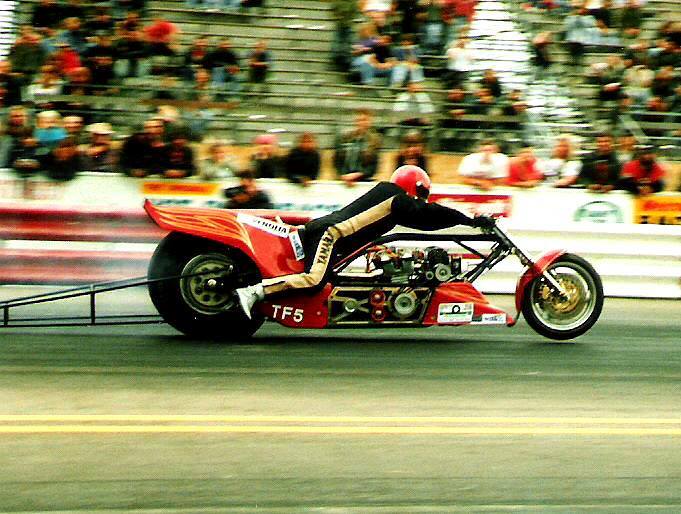 Brian started off racing in the Sportsman ranks of motorcycle drag racing during the 1970’s era. 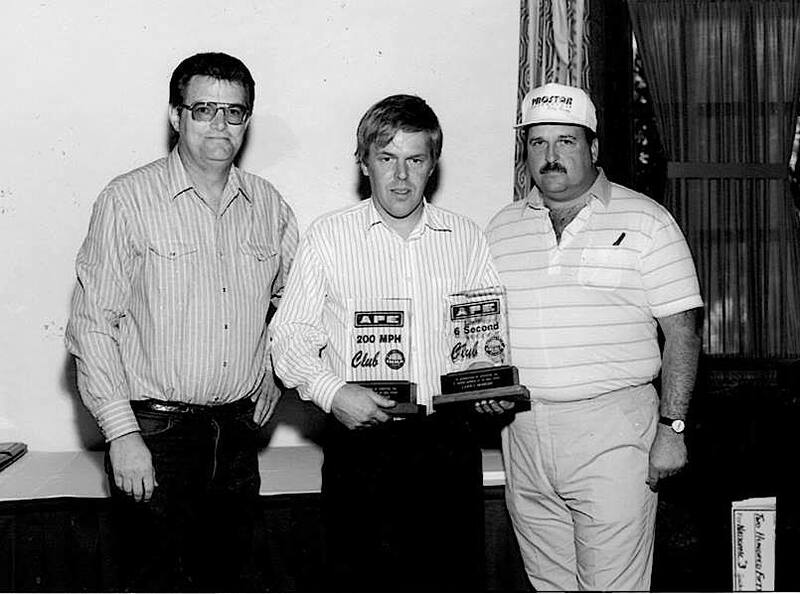 By the early 1980’s he had risen to become a standout in Pro Stock motorcycle drag racing securing championships in the class with the BDR, HRA and NDRC. Being the class act he always was, he even earned a Best Appearing award for both his bike and his team. No matter where Brian went drag racing, the one crew member that was always in his pit area was his lovely and loyal wife Ann. A woman who stood by her man’s side through thick and thin, throughout their decades of their marriage. 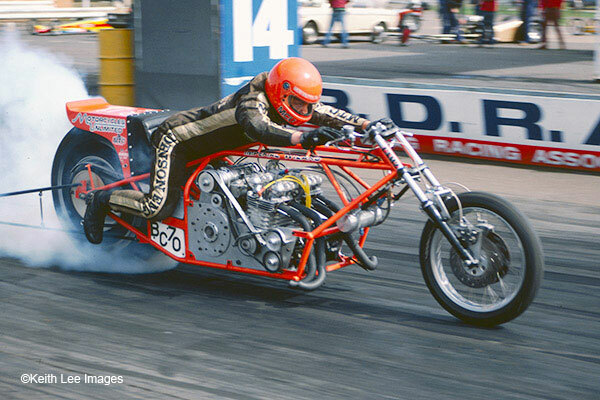 Over the years, Brian Johnson built and ode some of the most impressive dragbikes in the world. 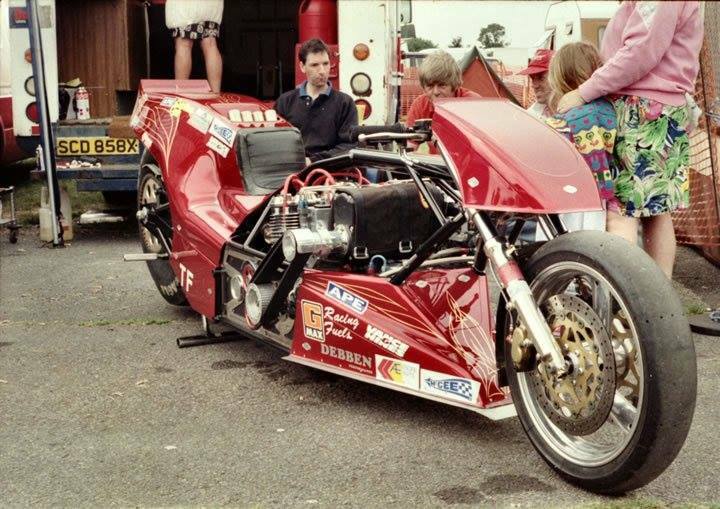 During the late 1970’s Brian developed a great racing relationship with Carl Ahlfeldt who owned and operated Motorcycles Unlimited, in Oklahoma, USA. Brian used to buy parts and go fast goodies from Carl, so they knew each other well when the big phone call came in 1982 that would forever impact Top Fuel bike. No matter where Brian Johnson went drag racing, the one crew member that was always in his pit area was his lovely and loyal wife Ann. Big Carl, as he was known, was a Top Fuel standout in his own right and in 1982, Carl and his T/F bike rider Sam Wills, had a parting of the ways. 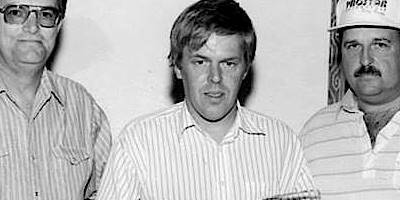 Carl, knowing Brian had a penchant for speed and the skills to drive, called Brian and offered him a chance to go from fast to going really – really fast. Brian said yes without hesitation and bought the Motorcycles Unlimited T/F bike. 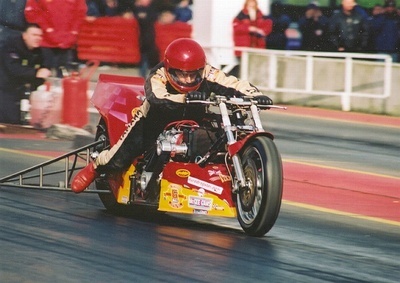 Brian changed over to Top Fuel motorcycle drag racing that year and took to nitro racing like a duck takes to water. 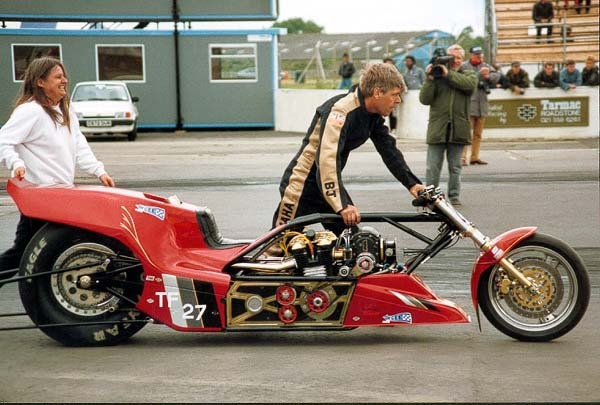 It is written that Brian won several meets that year and on at least one occasion was awarded “fastest bike” while racing at Santa Pod Raceway, a race track he called home. Brian Johnson’s number 1 plate awarded him by the IDBA, the International Drag Bike Association in 1984, is a definitive hallmark befitting this great racer. Early during Brian’s Pro Stock bike racing years, his bike was emblazoned with the words “Imperial Wizard” as he enjoyed naming his creations. When he took possession of Carl’s, Motorcycles Unlimited T/F bike, this particular bike became known as “Imperial Wizard II.” During the 1982/83 seasons, Brian got to know his new machine and with big balls and a heart to match, he sold his personal business, totally rearranging his life, to move to the USA, to live and race in Top Fuel bike for the following season. During the 1982/83 seasons, Brian Johsnon got to know his new machine and with big balls and a heart to match, he sold his personal business, totally rearranging his life, to move to the USA, to live and race in Top Fuel bike for the following season. When he did so, in 1984, Brian Johnson accomplished something no other Top Fuel motorcycle drag racer has ever done before or since. He traveled off to a foreign shore to do battle with the best they had to offer and won a sanctioned Top Fuel motorcycle drag racing championship. His number 1 plate awarded him by the IDBA, the International Drag Bike Association in 1984, is a definitive hallmark befitting this great racer. Brian Johnson feared no man and certainly not his motorcycles. During that fateful 1984 IDBA season it should be noted that Brian Johnson, with Big Carl Ahlfeldt tuning, beat Sam Wills, beat Larry McBride, and yes more than once beat Elmer Trett. 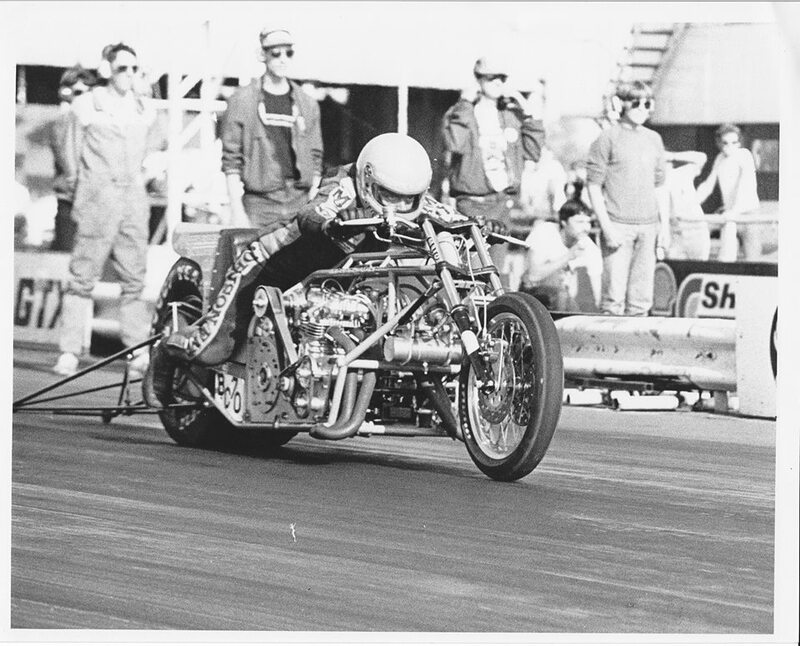 In the truest sense of the words, Brian Johnson was a true World Champion in Top Fuel motorcycle drag racing. In keeping with the motto of the great British Special Forces unit, the Special Air Service (the SAS), “Who Dares Wins” best epitomizes the Top Fuel motorcycle drag racing spirit that drove Brian Johnson. Brian and Elmer became very dear friends over the years. The Johnson family indeed stayed at the Trett residence on more than one occasion. It’s a historical fact that both Elmer Trett and Brian Johnson are both members of drag racing’s Hall of Fame within their respective countries. Brian was formally inducted into the British Drag Racing Hall of Fame on February 2nd, 2008. Brian’s racing years in Top Fuel bike spanned from 1982 to 2001. For nineteen years this man frequently traveled “across the pond” to race with and compete against the best Top Fuel motorcycle racers in the world. And on many occasions Johnson took his fair share of the win lights. He made his last pass in the seat of Imperial Wizard III with a blazing 6.101 elapsed time at 234.11 mph before selling his beloved bike to Jimmy Brantley. Brian earned his place in the APE Six Second Club and in the APE 200 MPH club as well during his racing efforts. For nineteen years Brian Johnson frequently traveled “across the pond” to race with and compete against the best Top Fuel motorcycle racers in the world. And on many occasions Johnson took his fair share of the win lights. There’s no telling how many British drag racers or European drag racers have been inspired by the exploits of Brian Johnson but I’ll tell you this; racers the caliber of Brian Johnson are few and far between. He came to a foreign shore, raced against the best of the best, and he won because he earned it. You see, who dares – wins. Editors note – Johnson loved the sport so much, after his riding days he set out on a new project to film the AMA/Prostar series. In this video Brain provides the voice over for Joe Koenig’s record run in 2002. 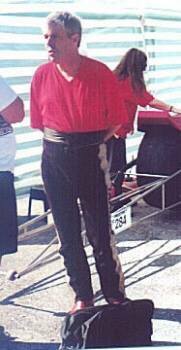 Uncle Brian, was not only a true legend at top fuel drag racing but an amazing uncle of whom I am very proud of. He will be sorely missed by all family and friends. Sorry to hear this sad news. He certainly was a dedicated, talented rider. So sorry to hear the sad news of Brians passing also the passing of his dear wife Brian was a gladiator of the drag racing world and his wife was the power behind him R.I.P.two amazing people. Had no idea Brian had passed til recently catching up on Drag Racing news. One of the nicest guys in the game and back in 1994 at Long Marston he signed a poster for me and I asked him if I could have one of his spent spark plugs from the Imperial Wizard and he obliged explaining why it was all burnt up etc due to the explosive fuel the Wizard used. Still have those and will getting them framed up soon. RIP Brian a true gent and a legend. Tim. Brian and Anne were dear friends, such amazing people. I met Brian while working at McLaren and hit it off with him straight away not knowing of his past at all!! Shared his love of photography which was another string to his bow. He’d built an observatory with a top notch telescope at the bottom of his garden where often we would sit and chat with Anne quenching our thirst with many a cup of tea!